Astrology is the path of seeking the connections between those of us on the Earth and the cosmos. By identifying the patterns of movement of the planets and their corresponding meanings, astrologers are able to relate this to a persons consciousness and motivations. As our zodiac sign reveals some of our basic behaviors, to have this symbol in combination with particular gems and metals, it can have a positive effect on you and those around you. With each stone, gem and precious metal having its own properties, make sure you choose ones which enhance and complement your personality. Your aura, the spiritual environment which surrounds you, can effect your health and well being. Although surrounding our bodies our aura is not visible to the naked eye, but to create balance and harmony with your inner self many people are taking the steps of wearing their zodiac symbol to aid in the the maintenance of a balanced spiritual state. Many people see the benefit of wearing their zodiac symbol in conjunction with their signs corresponding colors to aid in the creation of harmony with their inner self and nature. Nature guides us with colours. The colour red we associate with danger, its impact alerts the senses. Green is linked to healing and renewal, while black is linked to the unknown and with a hint of the mysterious. Your mood, thoughts, emotions and words creates a colour in your aura. Colors have a significant effect on your aura and notably on ones etheric body. With astrology associating a color to each planet, these colors can play an important role in our mood and spiritual balance. 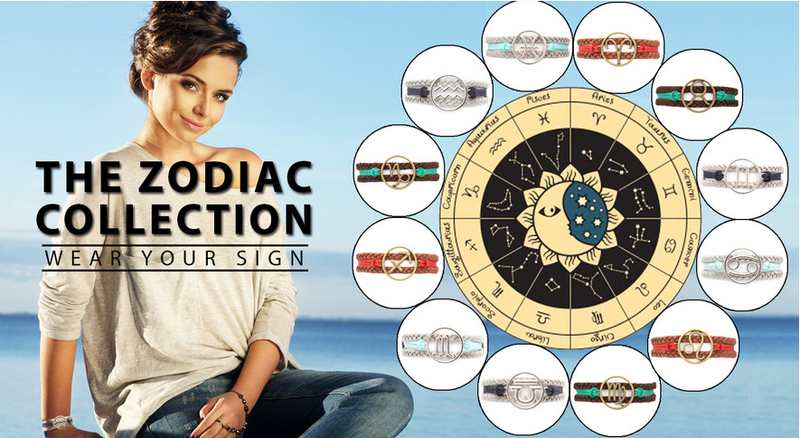 Get your Zodiac Bracelet designed by Ashley Bridget, there’s an exclusive offer for Fashionscopes fans. See below.